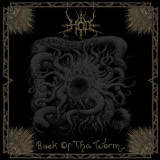 San Antonio blackened death metallers Hod, now in their fifth year of existence, have released a second full length, The Book of the Worm. This isn't what anyone would call a groundbreaking album, and though that's its biggest weakness, one weakness it definitely does not have is any softness or smooth edges. This is an album that pays homage to the sound of late 80s/early 90s death metal and intentionally doesn't go much beyond that. When the Ghouls Feed starts out with the complex riffing and mad-but-precise drumming expected of such a band. The vocals and song structure are a bit different, though; in between the craziness of the verses there are longer, more drawn-out passages that draw from an 80s black metal influence. Den of Wolves is more of an old-school death metal song, without any slowed-down parts and with a high, wailing solo. Vocalist Vladibeer Reebs' growl is not particularly deep and has some treble notes to it even through its grittiness, but it carries the songs well and doesn't get in the way. Through the Gates (They Come for Me) is somehow rhythmic, with a thrashing section partway through like Master does on a lot of its tracks. Death Whores is noisy and certainly heavy enough, but the subject matter is pretty mindless and repetitive, and the solo seems like an afterthought. But both Under Tyranny's Hammer and Where Are the Demons are crisp and have some excellent riffs to go with them; the ominous minor key parts that surface from time to time, and the chorus, give a black metal flavor to the latter. Beneath the Mountains of the Scorpion, on the other hand, ends the album with a final blast of thrashing, and the band puts a deep crunching/riffing counterpoint into the bridge and the end of the song that injects a wider dimension of low-frequency heaviness to the track. The Book of the Worm doesn't do much that is new, but it does it well, and the riffing's brutal complexity is excellent. It's definitely worth a recommendation if one likes the early 90s death metal sound of bands like Morbid Angel.